Offering a variety of services from publishing to websites. Visit our services page for details. 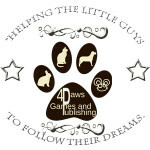 4 Paws Games and Publishing is a publishing company that publishes books, music, videos, photography and visual novel games. The owner has been publishing since 2012 but did not officially launch a business until 2015. The company publishes e-books which are then released through a multitude of companies such as Barnes and Noble and Apple just to name a few. We are able to format your book for Kindle (Amazon). Paperbacks are published and placed onto Amazon.com and we are currently working on producing our first visual novel for release next year. 4 Paws Games and Publishing is currently located outside of Humboldt, Saskatchewan, Canada. We offer our services to everyone around the world. “Helping the little guys to follow their dreams.” Offering a variety of services from publishing to websites. Visit our services page for details. We are now taking in submissions in all genres. All of our authors own full rights to their works, therefore if you are a publisher looking to sign an author, feel free to contact them.